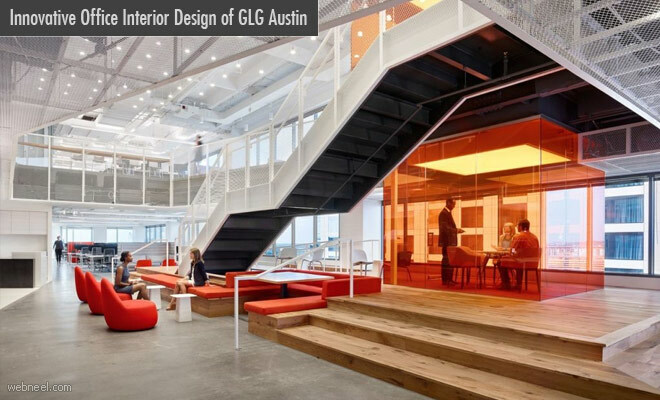 OFFICE INTERIOR DESIGN : GLG Austin collaborated with Clive Wilkinson to envision and design their office space to accommodate increased number of workers. The interior design ideas of clive are distinct and have human community in mind before designing. The company needs transparency, connectivity and opportunities to share which is taken care of by designers. The utilization of the corner offices and cubicles helps in additional communal spaces such as barista bar and plaza. The creative and comfortable working environment gives a work together approach with fruitful results. The interior design enables activity based working enabling variety of working styles.